I was born and raised in Minnesota and I currently own a home in South Minneapolis, where I live with my partner of nine years and a grumpy old cat and non-grumpy young dog. I cook and bake and do bookkeeping for a cafe to pay the bills. I have dabbled in the blog/ craft world but am not very good with computers so I tend to put off blogging or updating my etsy shops. 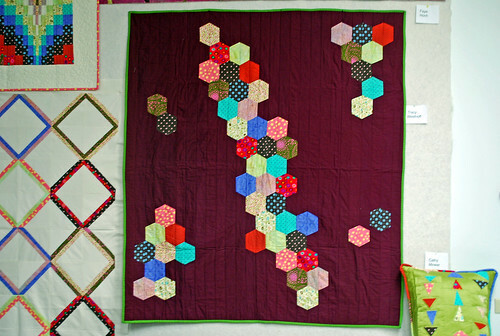 My blog is called The Dirtyard and is supposed to be chronicling my quilts and thing making. I have an etsy shop of my own work called Dirtyard Designs and a craft business of an upcycled bicycling-friendly accessory line called Breaksea Upcycle that I run with my neighbor. I do a lot of craft fairs and sales in MN and WI. I am an avid gardener and garment sewist, but I also knit, crochet, embroider, make dog clothes, do block and screen printing, make art, pickle and ferment things, etc. Except for tatting I have tried to learn pretty much all of what was once referred to as the 'domestic arts'. I also collect records. I have been quilting on and off since I was a teenager but I didn't start to take it seriously until about nine years ago. I learned to sew at age seven from my mother, who is a seamstress but not a quilter, and have had sewing jobs throughout my life. I have probably finished 20 sizable quilts and I am drowning in UFOs. I have some sets of blocks from at least 20 years ago and a whole bin of recent finished tops waiting to be basted and quilted. The majority of the quilts I've finished have been done in the past 6 years once I tried machine quilting. It varies with work and other sewing. At least 10 hours but as much as 40 or 50 if I am really into a project or have a deadline to meet. 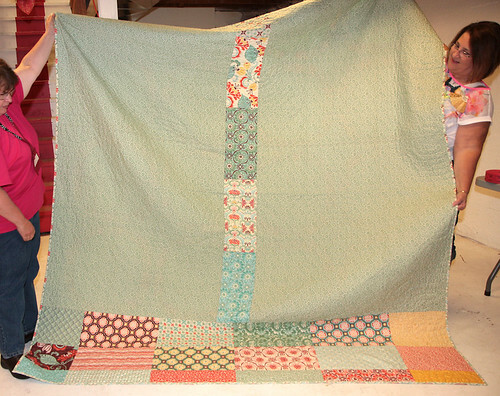 My first finished quilt is a wool fence rail quilt made from men's suit scraps and hand quilted with giant diamonds. I hadn't experienced the world of quilting fabric at that point and had some idea that machine quilting was taboo so I labored away on this 40 lb. quilt for years. It is quite warm but pretty unattractive. I am most proud of a baby quilt I made last year for a friend. It uses my favorite color combo (green and pink) and is all my own design featuring a tall bike with Mariner's Compass blocks for the wheels. The background is Drunkard's Path type blocks which had been on the to-do list for years. 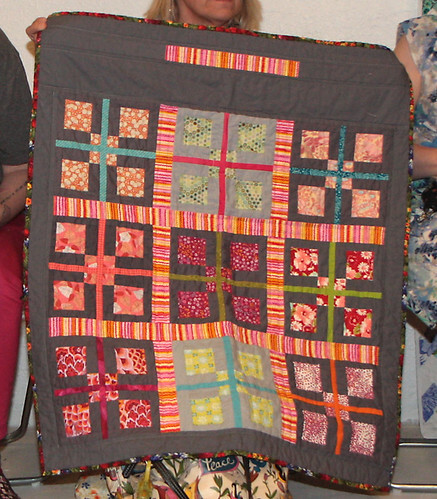 It is the first quilt that I really felt like I had a handle on everything as I did it. I have two sewing rooms, one for quilting and one for the craft business. They are chaotic arrangements of milk crates and Ikea shelving with a few scrap totes strewn about. I sew on a Juki industrial straight stitch machine that shakes the whole house. My fabric buying habits are limited only by my budget. I buy what I like in sizes between 1/4 and 2 yards if it is a good deal or on sale. I frequent thrift stores, S.R. Harris, 1/2 price areas in LQS, and online sales. My stash is out of control in size but organized by color and type. I also collect feedsacks and vintage aprons. To the untrained eye, I may look like a hoarder. My favorite thing is finding the secondary patterns in block layouts and my least favorite is that specific moment of anxiety when I start free motion quilting a new quilt. I know I have to do it but there is always a little panic. My current goal is to make my blog a real blog and use it to hopefully share, teach, or inspire somebody else to quilt or craft. My long term goal is to support myself from sewing and maybe long-arm quilting. 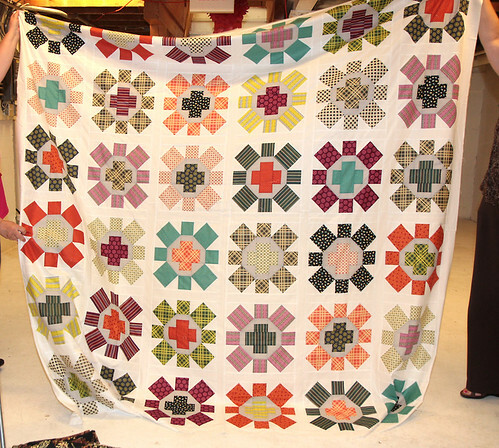 I would like to learn more about machine quilting and take some long-arm quilting classes. I would also like to learn more about fabric printing and designing. I am most inspired by quilts from the 1800s, specifically a book called Old Swedish Quilts by Asa Wettre. 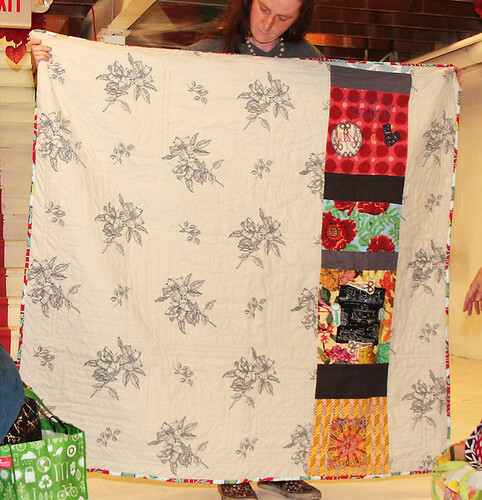 The fact that there were no rules, no right or wrong way, made for some amazing and inspiring quilts. I would say to trust your instincts and know that there are no real mistakes in quilting as long as you like the outcome. I joined this guild to try new things and challenge myself and so far I am very happy with how it is working out so thanks to every one!!! Like a lot of you (c’mon, confess), I am often guilty of neglecting the backs of my quilts until the last possible minute. One of my goals this year is to break this habit and come up with some more varied backs, not just the plain old single-color ones I have tended to favor in the past. I also have a thrifty side, and have scored a couple of winners at my local Goodwill. The first was a sheet that I stumbled on when I was working on my youngest daughter's quilt last year – it could not be more perfect, color-wise! The second find was purchased completely on an "it could be a quilt back someday" whim, and is now destined for my Swoon quilt. Not bad for a few bucks! 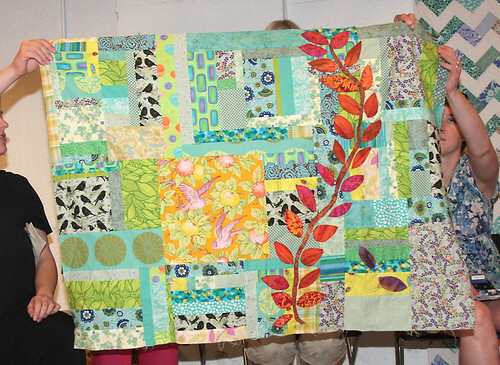 It's been so much fun to see all of the lovely quilt backs that you all show at guild meetings - they are so inspiring! 1. Business Memberships are now available. Briefly, the cost is $90/year and will be prorated to $56 this year or an additional $32 to upgrade for current individual memberships. There are a number of additional benefits for Business Members. 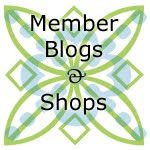 Please see the Members Only blog for more information. 2. Please consider signing up to do a blog post at least once per quarter. It's super easy and we are here to help anyone who has any questions. 3. Our Ten Minute Tip was given by Mary on how to use glue when sewing on binding. See her blog post here. 4. We had our monthly Block Lotto drawing and Rozina was the winner. 5. 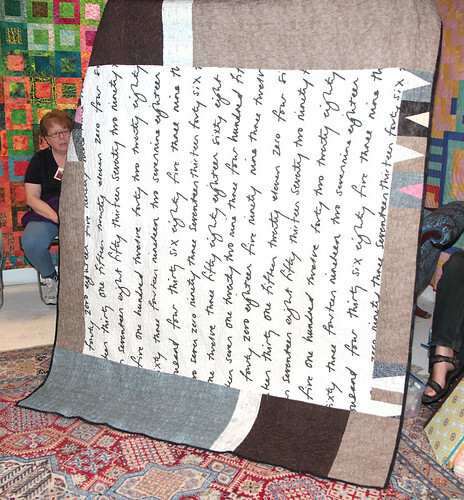 Spring Quilt Market Recap: Those who attend Quilt Market in Portland, Oregon shared what they saw and their take on current trends that we can expect to see in the coming months. 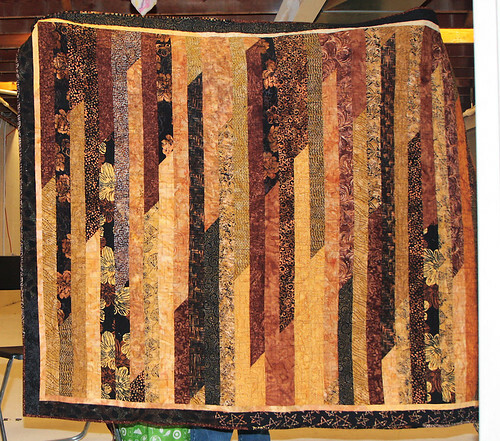 Vanessa of Punkin Patterns had her most recent quilt pattern on display at the Monaluna booth. Watch her blog for the pattern release. 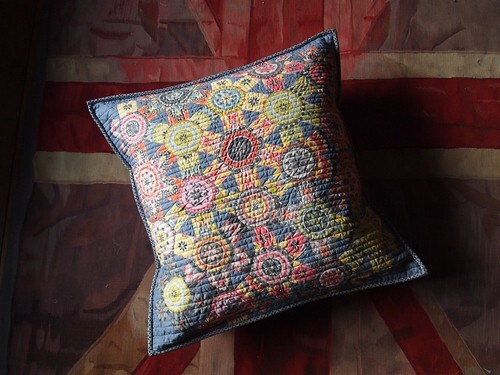 Modern fabrics are really taking over the fabric industry which is bringing younger people into sewing, but making it more difficult for shop owners to find traditional quilting fabrics, which are still in demand. 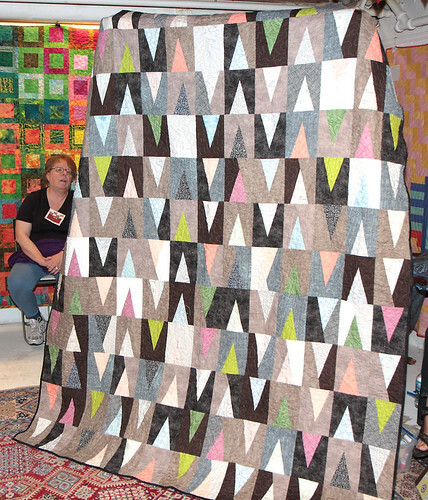 Jacquie Gehring from Tallgrass Prairie Studios, who is a board member of the Modern Quilt Guild (MQG), asked some of our MMQG members who were at quilt market, their thoughts on the MQG SewDown coming to Minneapolis in July 2014. Our members where pretty honest with her about our disappointed that they did not reach out to us prior to announcing the Minneapolis SewDown, the expense (rumored to be $750 for four days), and were they planning on offering a discount for local members who do not need to stay at the hotel. She appreciated the input and would bring up our concerns the next time she met with the MQG board. 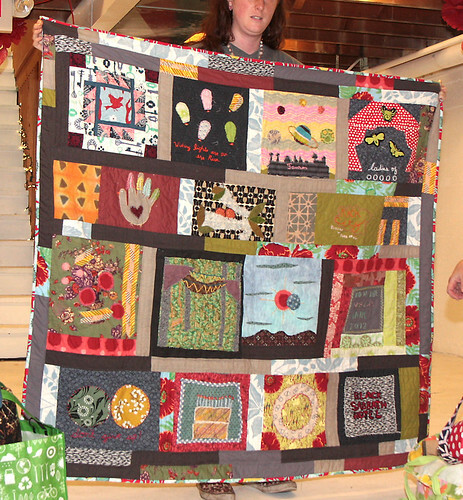 Take Along Challenge due September--make anything you would like that incorporates hand-sewing. Kristin passed out kits to those members in attendance that will help with your hand-sewing. Thanks again to Kristin for all the time and effort that she put into the kits. 7. We are Growing and Moving! - Due to our increasing membership, we are moving to the Textile Center starting with our July meeting -- Thursday, July 11th. Some of us will be there at 5:30 to set up and look around, Social Hour will start at 6 with the meeting at 6:30. The Center will be giving our members a tour of their library, which as members, we all have access to. Watch Facebook and the blog for directions as well as parking availability in and around the center. Please feel free to come early and check out the new space. 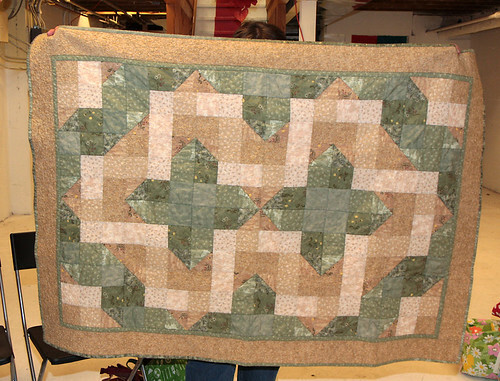 Mary hand quilted this king size quilt. Photo by Katy Jones at I'm a Ginger Monkey, used with permission. There are really never enough lazy days of summer...life can be busy as we make the most of these precious sunny days. 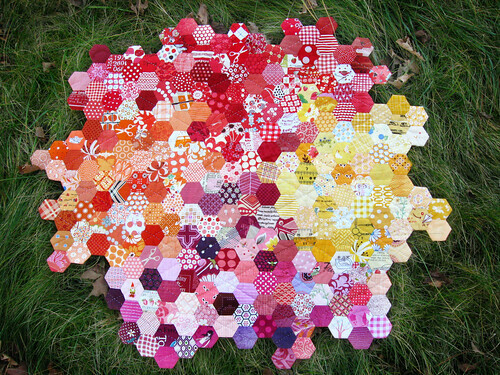 Accordingly, this months block is an English Paper Piecing Project. We will be using Katy of I'm a Ginger Monkey fame's Spring Carnival Tutorial for a block that can go to the beach, in the car, or in my case - to any of the 12+ baseball games and many hours of baseball camp that my boys have in the current 10 day span. Here is a link to her tutorial, which includes templates for the papers that you can print on cardstock and cut out yourself. The last page of the set of downloads is the instructions. On this page you will see two basic shapes in the top row. Each set of the two basic shapes will be the equivalent of one block. 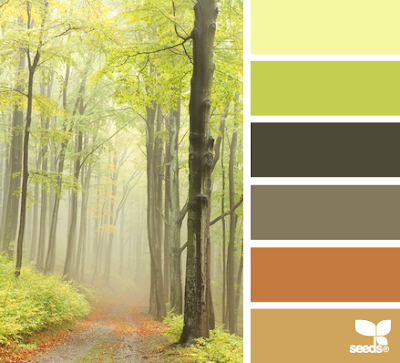 We will prepare these blocks for our July meeting, so I've chosen the Design Seeds Forest Hues palette which has a summers' end/Indian summer feel. I think these blocks would make a great set of pillows or table runner to carry your decor from August into September. For a background we will use creamy low volume prints and an assortment of the colors below in solids or small scale prints for the circular links. Please use a minimum of two different colors per block, with block entries not being identical. Everyone likes good looking binding and the best way to finish it quickly. Recently I have heard of people using glue to help them bind their quilts and I have found it very helpful. 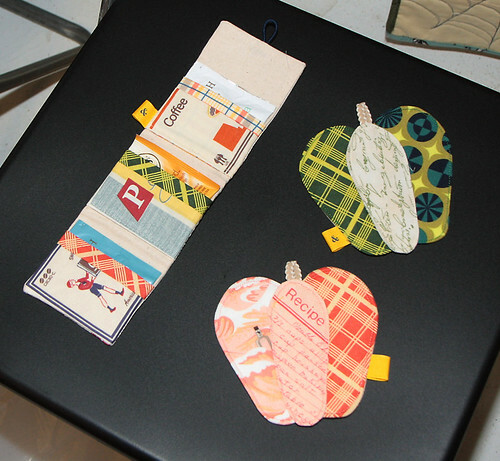 Next go to your ironing board and from the front of your quilt press the binding away from the front of the quilt. Turn your quilt back side up on the ironing board. Add a tiny line (or dots) of glue along the stitching line. Bring the binding around to the back of the quilt to cover the stitching by 1/16" to 1/8". Work on about 3" to 5" at a time or whatever is comfortable. Press the binding for 3 - 5 seconds until the binding is held in place by the glue. Turn quilt over and go to sewing machine. Stitch "in the ditch" next to the binding seam using thread that matches the top of the quilt on your machine and thread that matches the binding in the bobbin. I use a stitch length of 3.0. I pulled it apart a little so you could see the stitching. You are finished. Here is the back of the quilt. The glue washes right out when you wash your quilt. Please let me know if you have questions on either method - I'd be happy to answer them. 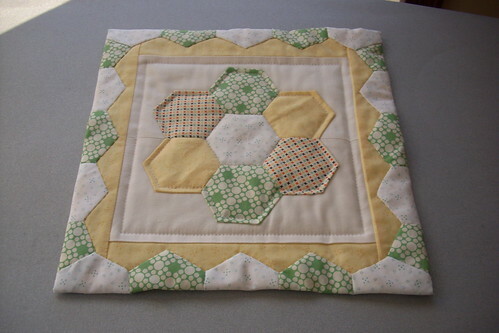 I rediscovered quilting via the internet about eight years ago. 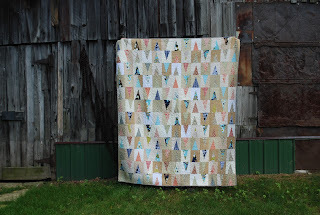 Since then, I've spent a lot of time creeping on quilt blogs such as Oh Fransson, Anna Maria Horner, Jaybird Quilts and my personal favorite, Film in the Fridge. 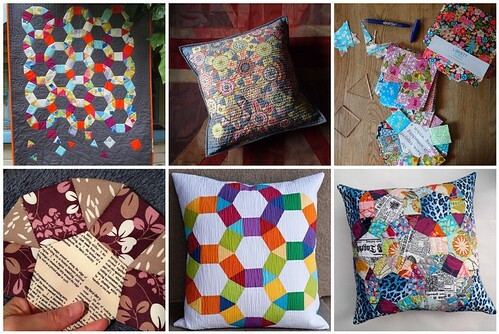 I've made quilts using tutorials from each of these blogs, but I always go back to Ashley at Film in the Fridge. 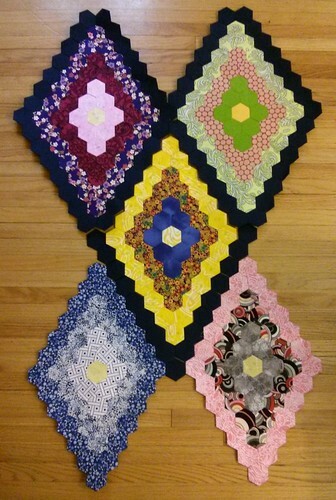 I've made a number of things using her tutorials including a few quilts using her block tutorials. 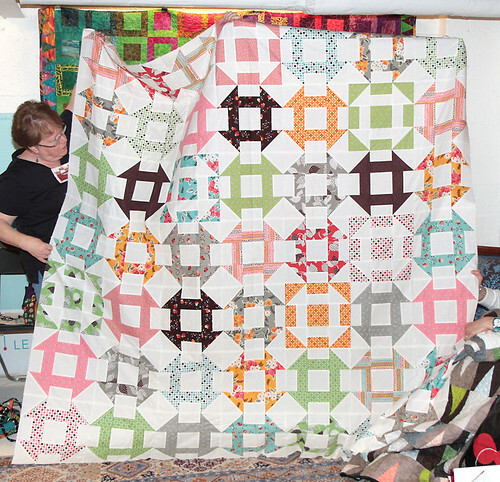 The first one I tried was her String Quilt Block tutorial back in 2009, which she used to make her Kaleidoscope Quilt. This was my first venture into using paper as a foundation for the blocks and her instructions and photos made it super easy to follow. I enjoyed making the first quilt so much, I just kept on going and made another one right away. Don't adjust your screen or strain yourself, it looks pretty much the same as the first quilt except it has blue binding. I cut so many strips from these fabrics that I could make a third quilt that would be close to identical to these two. The most recent tutorial I used was a variation of Ashley's Scrappy Triangle Tutorial. I've used it twice, with both quilts given as wedding gifts. Like all of her other tutorials, it's clearly written, with lots of photos and allows you room to make the quilt blocks and finished quilt your own size. I, however, haven't made the scrappy blocks like the tutorial. I prefer to use her Trailmarker Quilt post which uses the same basic tutorial, but instead of the triangles being scrappy, they're made from one piece of fabric and framed in various other solids or tone-on-tone solids. To speed up cutting out the triangles, I've made a cardboard template which keeps my triangles uniform. That's the only thing that I have done to personalize her original tutorial. Bloggers are pretty generous with their tutorials. I only wish I was as creative and could come up with my own ideas, but until then, I'll just keep checking out blogs and trying out their tutorials. Next up for me: The Starburst Block tutorial. It just may show up for Show & Tell at a Guild Meeting sometime in the future. Hi Everyone! It's Marie here - assigned to one of the last quilt back series. But, since I don't actually make quilts anymore (still working on my challenge quilt though!! 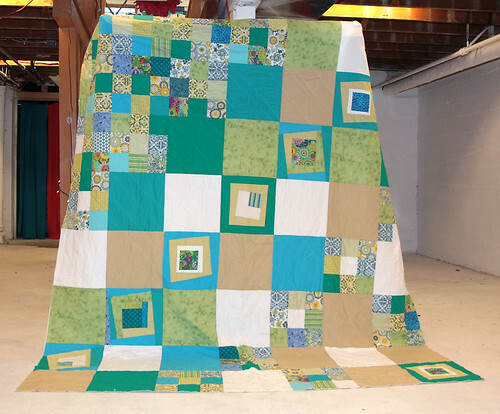 ), and I think my method for making a back has been covered through and through (using up scraps, extra blocks, whole backs with a vintage sheet, or really any fabric I can find to piece something together), I thought that I would go out on a limb for this post. I challenged myself to think ahead and come up with some creative quilt backs for yet un-started projects in my studio right now. "What?" you say? Yep - I drew some inspiration from a few different fabrics I have sitting around waiting to be projects and sketched out a potential back for each one. Do you want to see? I just found out that a couple of friends are having babies in the next 4-8 months, so of course I had to jump at the chance to go buy some fabric for baby quilts (confession: I bought both of these before I found out about baby #2 - but lucky me!). The first is a mod transportation theme from Timeless Treasures - I think it may be called "Fun". Which seems like a lame name, but whatever - it is pretty fun. I got a crazy idea a while back of putting a giant graphic on the back of the quilt - like transferring a photo or something, and I think this would be the perfect fabric to use. So I copied the style, drawing a bus and some graphic road lines along the bottom and up the top. I really am loving this idea. You could even use color blocks to form the bus, but if anyone has done photo transferring to fabric - please let me know - I'm so interested! Next up the second baby quilt - another graphic twist to the original fabric. I think 'Film in the Fridge' had an early quilt with an arrow on it - neat concept and could be really fun for a little kid. The fabric is a Riley Blake "Alphabet Soup" and I also have another coordinating fabric that is a smaller print. Fun colors, fun graphics...and really I had fun with these quick sketches. Just to show you another one that I've been working on - hoping it will be the back to my granny square swaps that may be a quilt someday too. I did this with another quilt (top) and really liked the method. I cut bunches of squares and will piece them together to make nine 9-patches. I thought it really helped with the random layout - there wasn't too much to rearrange, because I was only dealing with 9 squares at a time. (Sometimes I'm paralyzed by switching fabrics around, but I found if the 9 squares together look good and balanced, the rest of the 9-patches should too). So I have my stack and drew a quick sketch of what I hope to be the final 'feel'. So there. I just pushed myself to do something different (thanks blog!) and maybe inspired you to sketch or plan or dream about quilt backs.